Meanwhile, put the egg and breadcrumbs into 2 separate bowls. Sprinkle the flour evenly over the fish, coat with egg and then dip in the breadcrumbs, season with black pepper. Bake the fish in the oven for 20 minutes at 200°C. When the fish and chips are almost cooked, boil the peas for 5 minutes. 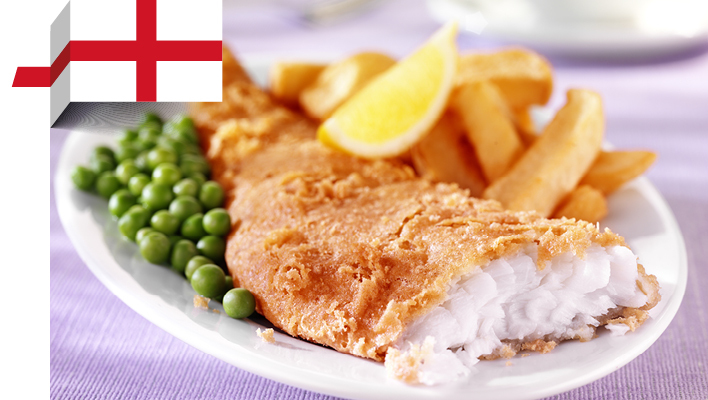 Serve the fish, chips and peas with a wedge of lemon. *If you don't have an Actifry, par boil the potatoes for 4-5 minutes, then spread on a baking tray, spray well with Frylight and bake for 30 minutes at 200°C/fan 180°C/gas 6, turning a few times during cooking. Spray a large saucepan with Frylight and cook the onion and garlic for 2 minutes. Add tomato puree, spices and harissa paste and mix to coat the onions. Add the chicken and stir well to coat. Cook for 2 minutes – add 1-2 tablespoons of water if necessary to stop the spice mixture from sticking. Add the passata, chicken stock cube, potato and a litle more water and mix well. Place the couscous in a large bowl and sprinkle with a tablespoon of water - use a fork to mix, separating the grains and clumps. Place the grains into the colander or steamer section that sits on top of the cooking saucepan. Add the rest of the water to the stew so it is well covered. Add the chickpeas and peas and give the pan a good stir – allow to simmer. Place the couscous on top so it can steam whilst the stew cooks. After 15 minutes, give the stew a stir – add more water if necessary. Fork through the couscous and then cook for a further 30 minutes. 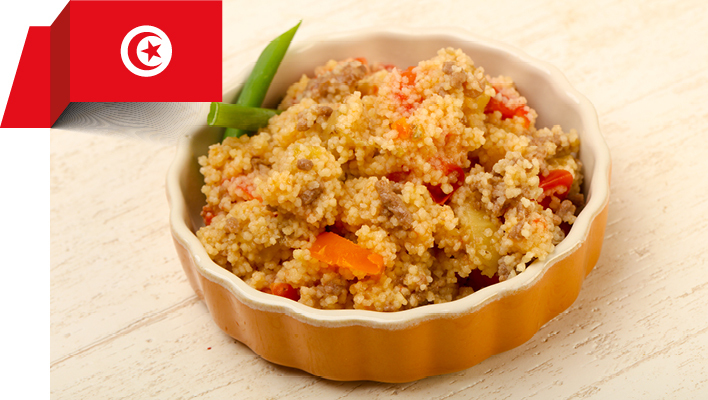 Once the meat is cooked through, turn off the heat and empty the couscous into a very large bowl. Drain the cooking liquid from the stew over the steamed couscous until the couscous is covered. Allow to stand for 5 minutes so the liquid can be absorbed. Serve the couscous with the chicken and vegetables – enjoy! In a bowl, mix the salt, coriander, oregano, garlic, and olive oil. Rub the mix over the chicken and leave to marinate for 10 minutes. In the meantime, peel and chop the cassava and onion into bite-size chunks and set aside. Heat a large pot over a medium heat. Add the chicken, place a lid on it, and let it sweat for about 7 minutes. Add the onion and chicken stock. Bring to the boil and then reduce to a low-medium heat and simmer until the chicken is cooked through. Raise the heat to medium and add the cassava. Bring the pot to a gentle simmer and cook until the cassava is done (approximately 10 minutes). Season with black pepper and serve with white rice (remember to add the extra calories). 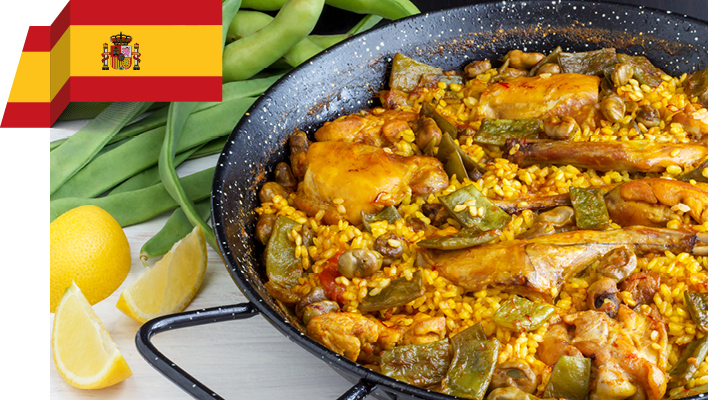 Heat the Frylight in a paella dish or large shallow frying pan. Brown the chicken and rabbit and in the pan for 5 minutes. Add the green and butter beans and cook for another 5 minutes. Add the garlic, paprika, tomato and water. Boil for 10 minutes. Distribute the saffron and rice evenly into the pan. Boil on a high heat for 8 minutes. Add rosemary and salt to taste. Turn the heat to low and simmer for a further 8 minutes until the bottom layers of rice are crispy. Serve with lemon wedges and enjoy. 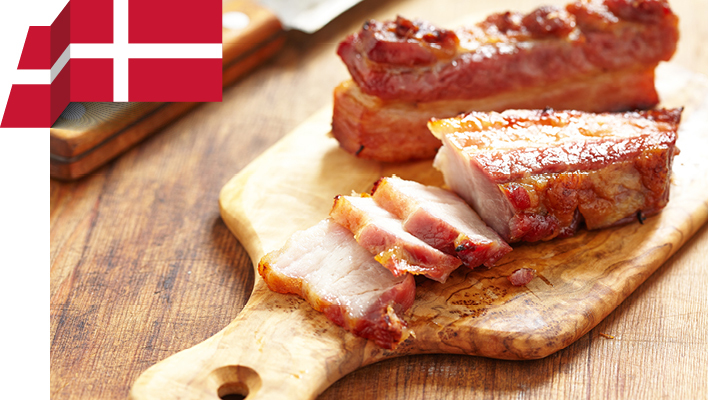 Cut the pork belly into thick slices (about 0.5cm) – then dry the slices using kitchen roll. Season with salt and pepper. Put the potatoes into a pot and cover with cold water. Boil for 15-20 minutes. To make the parsley sauce, add the butter and flour to a sauce pot and stir continuously, allowing the butter to gradually melt. Stir in a little milk and repeat this until the sauce has the consistency you like. Add the whipping cream and parsley and simmer for 5-10 minutes. (Do not let it boil). In a hot pan, fry the pork belly slices for a few minutes on each side, until crispy and golden. Dry again on kitchen roll and keep the slices warm in an oven until serving. Place the pork on a warm plate with the potatoes, then pour the parsley sauce over the potatoes. Sprinkle with fresh chopped parsley and serve. In a saucepan, brown the onion and meat. Add 180ml water, the stock cubes, sauces and seasonings and bring to the boil. Cover and simmer for 15 minutes. Blend the flour with the remaining water to make a smooth paste. Add to the saucepan and bring to the boil again, stirring continuously for 5 minutes. Turn off the heat and let it cool. 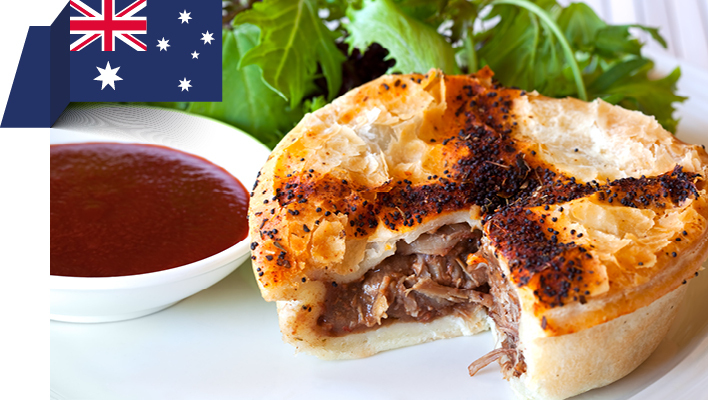 Line a lightly greased pie plate with the shortcrust pastry and spoon in the cooled meat filling. Moisten the edges of pastry base with water and top with the puff pastry, making sure you press down gently to seal the edges. Trim and score edges, then glaze with the egg. Heat oven to 220°C/fan 200°C/gas 7. Bake for approx 40 minutes until the pastry is golden. Serve with some delicious homemade chips (remember to add the extra calories). Place the mussels in a large bowl of cold water. Sort through by lightly tapping any that are open to see if they close shut. Discard any damaged mussels and ones that remain open. Pull off the beard, and remove any barnacles using the back of a knife – rinse well. Thinly slice the vegetables, garlic and chilli. Stack the thin sticks together and finely chop. Add the thyme sprigs (without stalks). Heat oven to 200°C/fan 180°C/gas 6. Peel the potatoes and cut into chunky chips. Parboil for 4-5 minutes, then spread over a baking tray and spray well with Frylight. Add to the oven and bake for 30 minutes, turning a couple of times during cooking. With about 10-15 minutes left for the chips, place a large sauté pan on the hob until very hot. Pour in the oil, then immediately toss in the vegetables, chilli and thyme. Cook for about 1-2 minutes, shaking the pan and stirring the vegetables until they start to wilt. With the heat still on high, toss in the mussels and shake the pan so they form an even layer. Cover with a lid and cook for another 1-2 minutes, shaking the pan once or twice. Pour the wine and Pernod into the pan – shake and cook for another 1½ minutes, then cover again and cook for another minute. 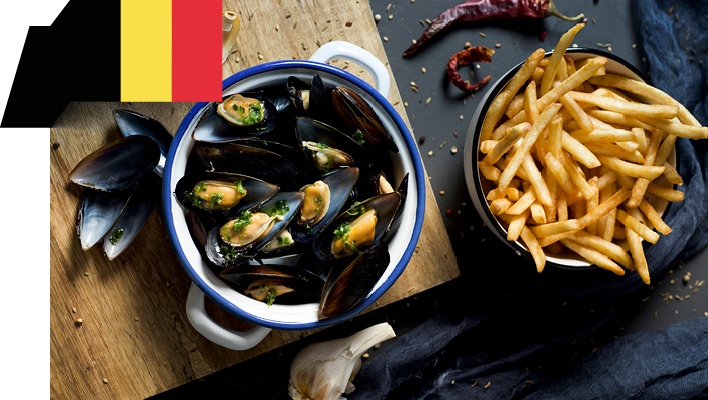 Tip the mussels and vegetables into a colander (over a bowl to catch the liquid). Discard any mussels that remain closed. Pour the liquid back in the pan, reheat and stir in the créme fraîche and parsley. Return the mussels and vegetables to the pan and reheat, shaking the pan, then divide between two large soup bowls. Serve with chips and reduced fat mayonnaise (remember to add the extra calories). Place the cod in a large bowl and cover with cold water. Leave to soak for at least 12 hours, draining and covering with fresh water every 3-4 hours. When you are ready to cook, separate the parsley leaves and stalks. Finely slice the stalks and put the leaves to one side. Peel and finely slice the shallots into rounds. Using a peeler, peel away a few strips of lemon zest. Half-fill a large pan with water and place over a high heat. Bring to the boil, then reduce to a simmer. Drain and add the salt cod, then add the parsley stalks, shallots and lemon peel. Poach for 20 minutes, or until the cod starts to soften and flake apart. Meanwhile, put 2 tablespoons of olive oil in a large frying pan and place on a medium heat - add the onions. Season with pepper and cook for 15-20 minutes or until golden and starting to caramelise, stirring regularly. Meanwhile, crush the olives into a medium bowl. Roughly chop the parsley leaves and add half to the bowl along with the chilli flakes, vinegar and olive oil. Mix well, then set aside. Using a slotted spoon, remove the salt cod to a plate. Pick out any bones, then flake the flesh into the onion pan along with a good splash of the poaching liquid. Cook for a further 10 minutes over a low heat, then remove the pan from the hob. Peel, then finely cut the potatoes into matchsticks using a sharp knife (a mandolin may be easier). Place a medium pan over a high heat, spray with the Frylight and allow to heat up. Add the potato matchsticks and cook for 1 to 2 minutes, or until very lightly golden but not cooked through. Transfer to a plate. Return the cod mixture to a medium heat, then stir in most of the remaining chopped parsley. Pour the eggs into the pan and gently stir. Fold in three-quarters of the potato matchsticks and take the pan off the heat – the eggs will continue to cook in the pan, so make sure you don't overcook them at this stage. Return the remaining potato matchsticks back to the pan (spray more Frylight if needed) and cook for a further 2-3 minutes, or until golden and cooked through. Season with salt. 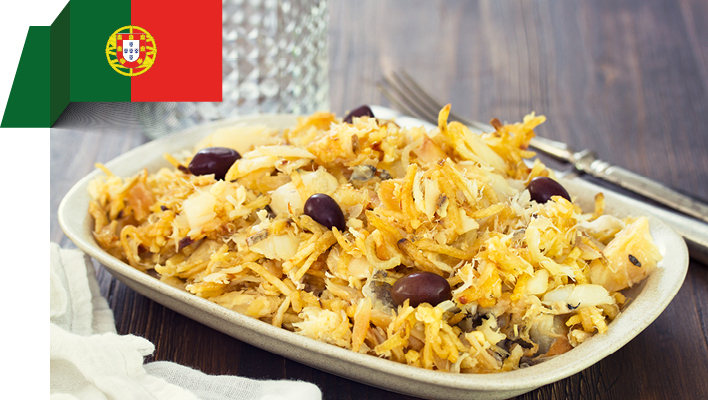 Transfer the bacalhau to a serving dish and top with the crispy potato matchsticks. Spoon over the marinated olives and sprinkle the remaining chopped parsley on top.Serve with a green salad (remember to add the extra calories). Heat a large saucepan with a lid and spray well with Frylight. When hot, add the bacon and fry until crisp. Remove the bacon and immediately use the pan to sear the ribs, chorizo and pork shoulder (add more Frylight if needed). Season with salt and pepper. Remove the meat and set aside. Add the onion, garlic and chilli flakes to the pan. Season with salt and pepper and cook for 8 minutes or until soft. Add the meat, bay leaves, white wine vinegar and drained beans. Add just enough water to cover. Bring to a boil then reduce the heat to a simmer. 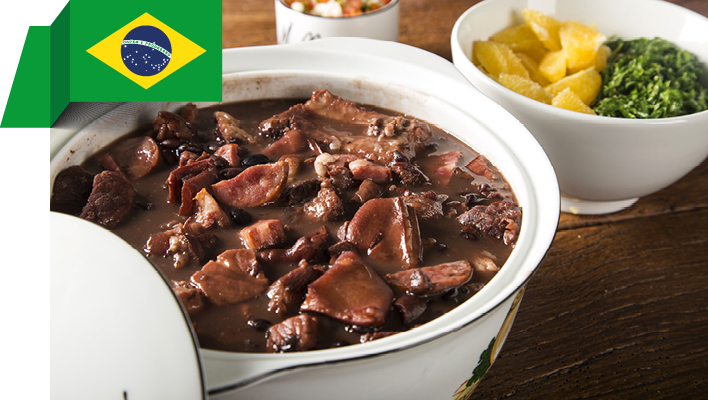 Cover and cook for approximately 2 hours, or until the beans are soft and the meat is tender. This dish is traditionally served with rice, a sprinkle of parsley or coriander, hot pepper sauce and orange slices (remember to add the extra calories). Meanwhile, put the ketchup into a small saucepan on medium heat. Once warm, add the baking soda and stir continuously until the foaming lessens. Reduce to a low heat and add the spices, stir well (leave 1 tsp curry powder for the end). Add the Worcester sauce, broth and water and combine. Simmer for 5-10 minutes. 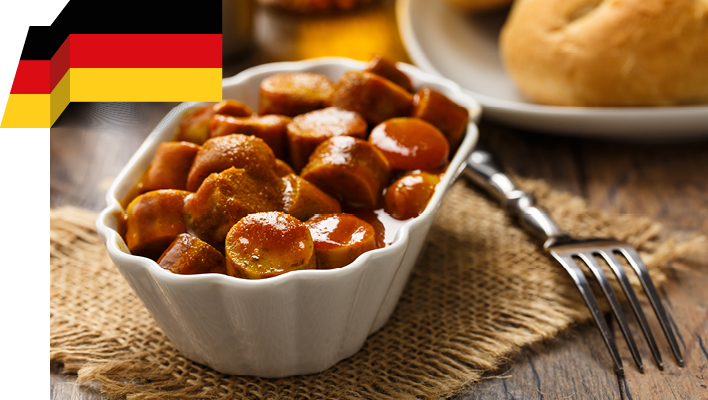 Grill the Bratwursts, then slice into bitesize chunks and cover in the sauce (any leftover sauce can be stored in an airtight container in the fridge for up to a week). Top with a sprinkle of the leftover curry powder. Serve with the homemade chips. Rinse the sushi rice in a colander, massaging it with your hands until the water runs clear. Leave to drain for 15 minutes. Put the rice in a saucepan with 200ml water and mirin. Bring to the boil, cover with a lid, reduce the heat to low and simmer for 20 minutes until the liquid is absorbed. Remove from the heat and set aside (still covered) for 15-20 minutes. Transfer the rice to a large bowl and pour the vinegar over,add a good pinch of salt – now mix together. Cover with a damp tea towel and set aside at room temperature until ready to use. Put 1 nori sheet on a bamboo mat and cover the surface with half of the cooled rice. Lay half of the salmon and cucumber slices along the length of the rice in a strip, being careful not to overfill it. Run half the wasabi along the edge of the filling with your finger. Roll up tightly and squeeze to seal when you reach the end. Repeat with the remaining nori, salmon and cucumber, and more wasabi. 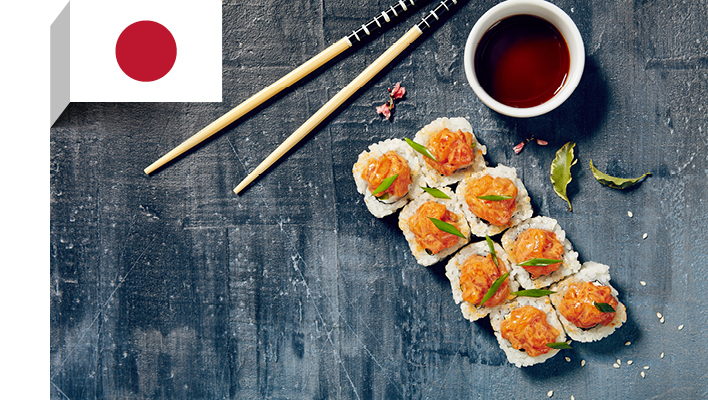 Slice each roll into 6 pieces, and serve with extra wasabi, ginger and soy sauce. Put the flour, salt and sugar in a large bowl. Add the egg and stir until well mixed. Add the milk and continue to stir. Then add the water and keep stirring until blended. Now knead the dough with your hands. 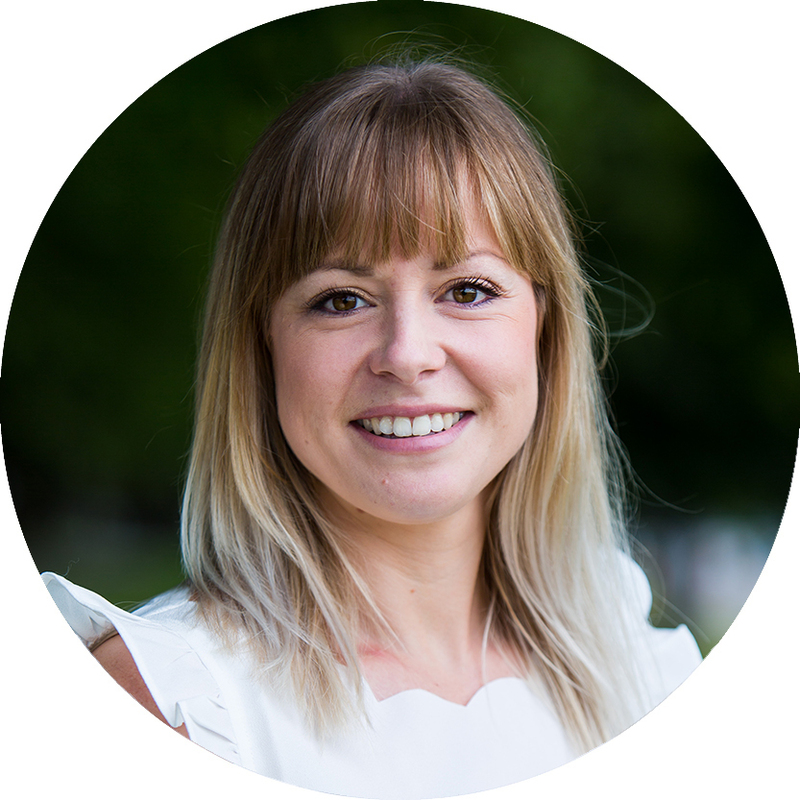 Once it is elastic and soft and doesn't stick to your hands, wrap in lightly greased cling film and put aside for 40-50 minutes. Meanwhile, prepare the meat by mixing together the beef and turkey in a large bowl. Grate the onion into the meat mixture – the onion juice will make the meat softer. Season with salt and pepper and mix. When the dough has proved, knead again until soft and elastic. Cut a piece of the dough (about an apple size) and roll evenly until thin (about ½ centimetre). You may need to add a little flour to stop the dough sticking to the work surface. Cut circles from the dough using a glass or a cutter. Put about 1 tsp of meat in each circle and make the shape of the ravioli. 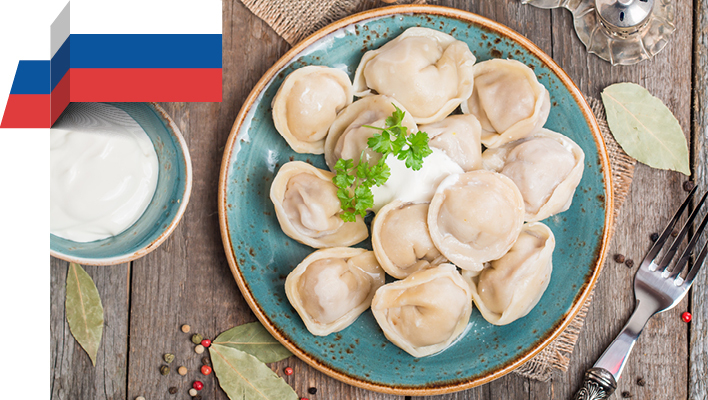 When the raviolis are ready, drop into a large pan of boiling water and cook for 10 minutes. Ravioli will float to the top when cooked - remove from the pan with a slotted spoon. Serve with a toppings or sauce of your choice (remember to add the extra calories). Preheat the oven to 190°C/fan 170°C/gas 5. Dry-fry the bacon in a pan for 5 minutes until crisp, then chop into small pieces. 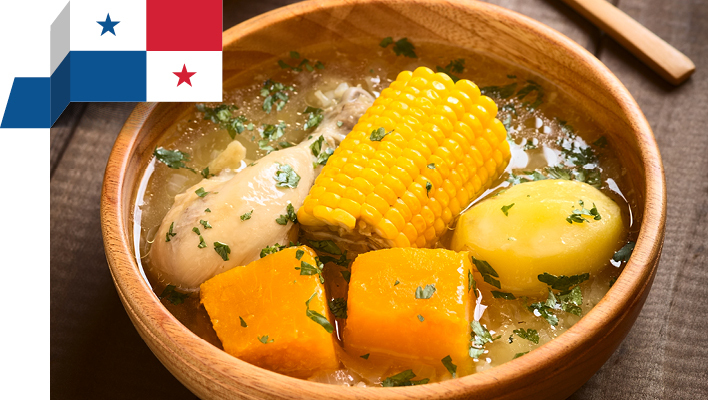 Boil the whole potatoes for 5 minutes, then drain and place in a bowl of chilled water. When cool enough to handle, pat the potatoes dry and roughly grate them into a large bowl. Toss with sprays of Frylight as you go, to stop them from sticking. Place a baking sheet in the oven for 5 minutes to warm through. Grease a 23cm loose-bottomed cake tin with butter. Scatter the potato over the tin (try not to pack it down) then dot all over the top with butter. Place on the hot baking sheet and bake in the oven for 1 hour 20 minutes until the potatoes are cooked through and crisp on top. Put the breadcrumbs in a large bowl and add 60ml water. Leave them to absorb the liquid (approximately 5 minutes). Add the pork and beef mince, onion, egg, allspice and seasoning to the breadcrumbs and mix with your hands. Don't over mix or the meatballs will be heavy. Take a tablespoon of the mixture and roll it into a ball. Repeat until you have used up all the mixture (aim for about 30-40 meatballs). Place a frying pan over a medium heat and spray with Frylight. Fry half the meatballs, shaking the pan frequently. When they are nicely browned, turn down the heat and cook for a further 10 minutes. Remove the meatballs from the pan and keep warm. Spray the pan with more Frylight and cook the remaining meatballs in the same way. When the meatballs are cooked, remove the pan from the heat, add the warm water and use it to scrape up all the meaty bits in the pan. Bring it to the boil and let it simmer for a minute or two. Sieve the mixture into a saucepan, add the stock cube and stir until dissolved. Mix the 100ml cold water with the flour and stir until dissolved. Pour into the saucepan of warm water and whisk continuously as you do so. Simmer the sauce for 5 minutes. Add the soy sauce and cream. Heat for another couple of minutes, stirring continuously. Taste and seasoning to your liking. 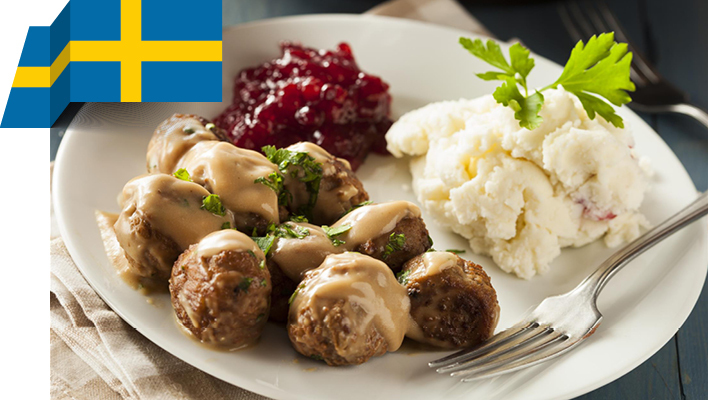 Serve the meatballs with a light coating of the sauce. Pour the rest of the cream sauce into a jug for people to help themselves to if they want more. 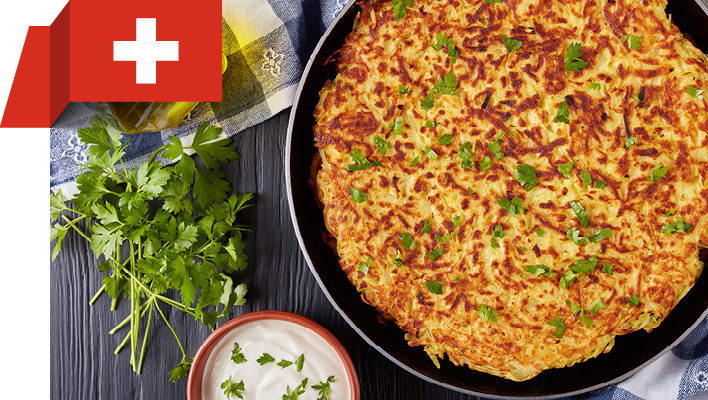 Traditionally this is served with mashed potato – just add the extra calories for these. 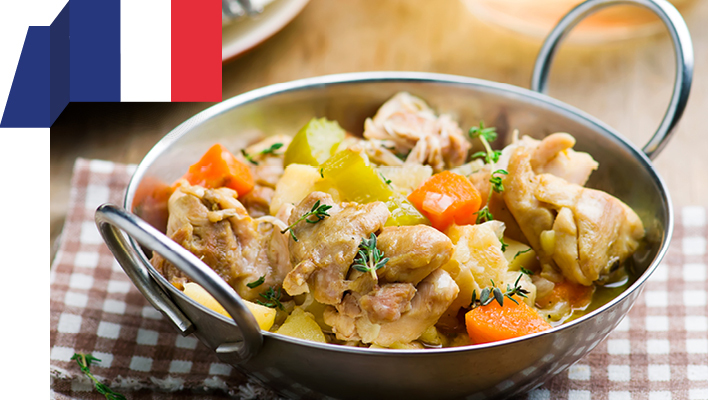 Place the chicken in a large casserole dish, then add the remaining ingredients. Season and add enough cold water to cover the ingredients. Cover the casserole dish and transfer to the oven to cook for two hours. To serve, ladle the vegetables into a bowl and place the meat on top.